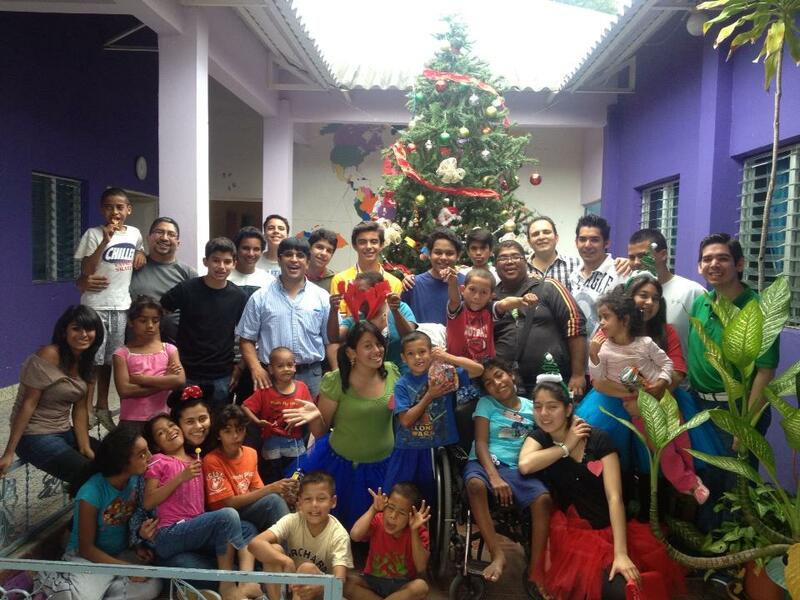 We seem to be experiencing a lot of little Christmas miracles here in Honduras this week. The “Team Navidad” that was here from Wednesday, December 4th through the 11th certainly got us into the spirit. There was tree decoration, caroling, and gift giving. 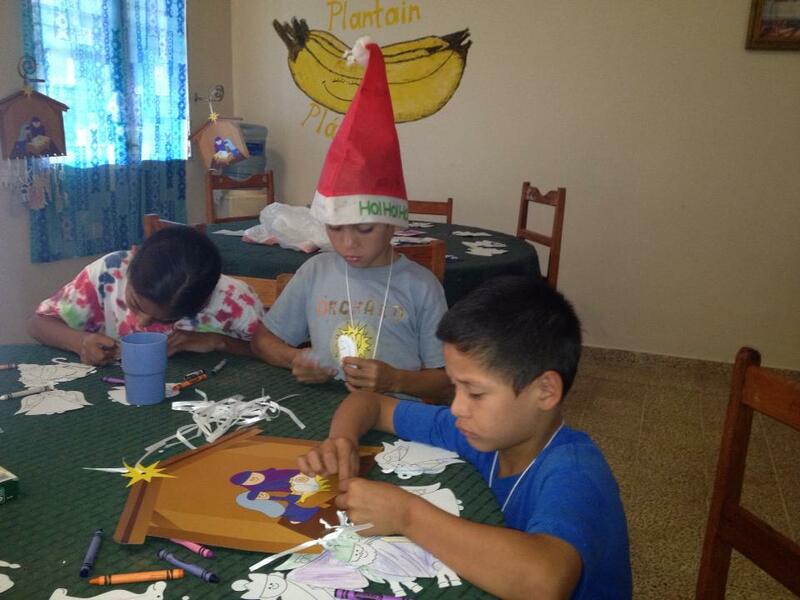 Not only for our own kids, but we all spread the joy into our little pueblo de Nuevo Esperanza and some of the very small surrounding communities. It was such a joy to see: piñatas, toys, and everything culminating with a Tuesday afternoon pageant in the local Evangelical church / town center. The spirit continued. On Sunday, well after the group had left, we had a visit from a church group in Tegucigalpa. They too invited the kids from Nueva Esperanza up to the mountain for an afternoon party. After the piñata, we gave out gifts. We abided by the rule: first the visiting kids can get gifts, then if anything is left over, our kids. I was carrying the youngest of our kids on my shoulders. He was having a hard day because his family had visited in the morning. When they left, he started crying. I was giving him some special attention. As the toys were being distributed, I broke the rule and brought him over to receive a plastic car. It seemed to make him happy. But, still on my shoulders, he directed me over to a visiting kid, a little younger than himself, sitting alone without a toy. He gave the boy his toy. He’s five. Laura and I have been having nice things happen to us as well. Wednesday, I drove the Ford pick-up truck into the airport at Tegucigalpa filled with Team Navidad’s luggage. Laura and I needed to go to the immigration offices that are near the airport in order to attempt to attain our residency status. We believed we had all the paperwork, especially the copies of each page of our passports (even the blank ones). They won’t make copies for you at immigration. We still expected we would have problems, but oddly enough it seemed to go relatively smoothly. We did have to leave the office to pay the $200+ each for the two year residency at the bank and to get two passport size photos. But we did that with relative ease and returned. We then had to endure the bureaucracy known as Doña Patty. Doña Patty is apparently the last stop prior to receiving residency in Honduras. But we saw her quickly. She told us to sit back down and wait, however, because she had to find us folders for our paperwork. Fifteen to twenty minutes later she called us back up. She had two folders, but one had doodles and calculations in pen on the inside. She apologized for it, but Laura quickly said it was all right. I made the mistake of saying that Immigration needed to buy some folders. Doña Patty informed me that the folders were actually our responsibility. I thought that I had sunk us. But Laura started up a conversation with Patty about our work with the kids who are HIV+. She must have touched Doña Patty’s heart because within ten minutes we had our residency. Odd though, we have no address in Honduras because we live in a house on a street that does not have a name. This is apparently not a problem. We promised Doña Patty that when we return for our residency card within three months that we will be sure to bring her some file folders. When we had left that morning for Tegucigalpa we had another surprise. Walking down the unnamed street where we live Laura heard a strange sound. She noted it to me and I heard it as well. Unbelievable. Could it be? Yes it was!!! Water was running from a faucet into an outdoor water reservoir at someone’s house! The town had water! Of course, we had simply assumed that we didn’t have water in the morning so we had poured buckets over our heads to take showers as we had done every morning. We would have water upon our return! But alas, upon our return that afternoon, still no water. The word was they were turning it on in shifts. We didn’t believe it, however. We saw no further evidence of running water. We were sure it was a trick. Thursday morning there was still no water. But on Thursday afternoon I opened the kitchen faucet on a whim. The source of all life flowed rapidly into the kitchen sink. I was speechless. What an incredible blessing! Saturday night we invited some people for dinner at our house. We had chicken marsala (sort of), with potatoes and carrots. We drank a lot of wine and laughed loudly. Two of our guests planned to go to Valle de Angeles on Sunday. They had heard about the crèche that I had bought there the week before and the missing baby Jesus. They took a picture of it as proof that Jesus hadn’t arrived. Late Sunday afternoon Jesus was presented to me, wrapped in swaddling, brown paper. Jesus is actually too big for my set, about half the size of Mary. I think he looks fine there though. Maybe to some he would seem out of place, but then again, when was the last time you had to bring your own file folder into a federal government office? Jesus comes in all different sizes. This will be the last week until about the middle of January that I will publish a blog. Laura and I are taking a two week vacation in the States for Christmas. I really enjoy writing this blog and I hope you enjoy reading it. Most of you received an email inviting you to support Laura and me in our work here. I’d encourage you to go to Montaña de Luz’s web site. Learn about the kids, our mission, and the many ways that you can be a part of Jesus’ ongoing birth.